BOOK OF HOURS - Leaf from a book of hours, containing the 'Litany of all Saints. BOOK OF HOURS - Leaf from a book of hours, containing the "'Litany" of all Saints. 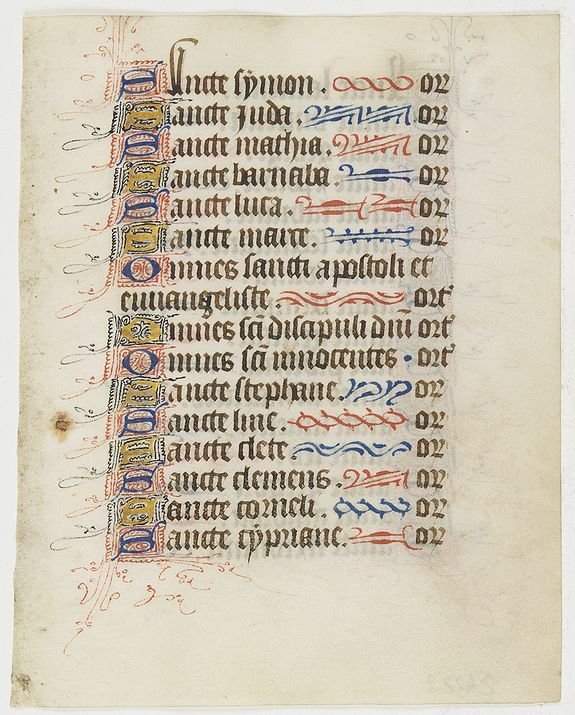 Title : Leaf from a book of hours, containing the "'Litany" of all Saints.. Date : Flanders, ca. 1440. Size : 4.7 x 3.7 inches. / 12.0 x 9.5 cm. Description :A decorative leaf stating 31 Saints. RECTO: Fifteen 1-line initials in burnished gold or blue on coloured grounds and thirteen line-fillers. VERSO: Sixteen 1-line initials in burnished gold or blue on coloured grounds and sixteen line-fillers. Condition : 16 Lines of text in Latin, written in a brown late gothic book hand.